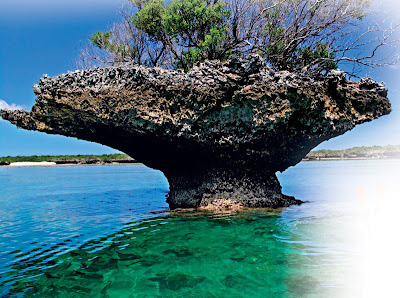 Aldabra is a raised coral atoll more than 700 miles (1,100 km) from Mahé, the principal island of the Seychelles and is closer to the coast of Africa and is 265 miles (426 km) northwest of Madagascar and a similar distance northeast from the Comoro Islands. 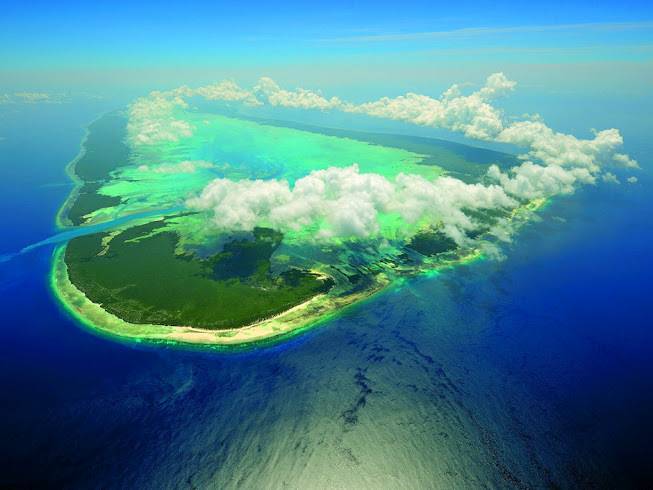 The atoll is located at 9°24′S 46°22′E and belongs to the Aldabra Group, one of the island groups of the Outer Islands of the Seychelles, which includes the island of Assumption and the atolls of Astove and Cosmoledo. The atoll is the second largest in the world by land area, after Kiritimati. It is 34 km long, 14.5 km wide, and up to 8 meters above sea level, and has a land area of 155.4 km². The lagoon measures 224 km² in area, of which roughly two thirds fall dry during low tide. The atoll consists of a ring of four larger islands: counterclockwise, they are South Island (Grand Terre, 116.1 km²), Malabar or Middle Island (26.8 km²), Polymnieli or Polymnie Island (4.75 km²) and Picard or West Island (9.4 km²). Additionally, there are some forty smaller islands and rocks, all inside the lagoon, except a few very small islets at the West Channels between South and Polymnie Islands, the largest of those being Îlot Magnan. The largest islands inside the lagoon are Île Michel (Michael Island), in the east (0.34 km² or 0.16 sq mi) and Île Esprit (Spirit Island), in the west (0.41 km² 0.13 sq mi). Uninhabited (apart from a small staff of rangers) and extremely isolated, Aldabra is virtually untouched by humans, has distinctive island fauna including the Aldabra Giant Tortoise, and is designated a World Heritage Site. 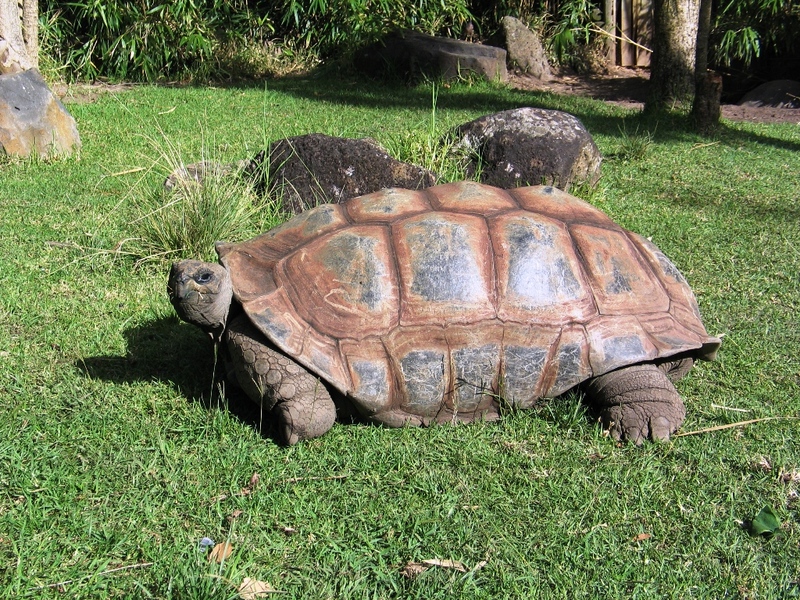 The atoll is home to the world's largest population of giant tortoises, the Aldabra Giant Tortoise (Dipsochelys dussumieri), numbering some 100,000 individuals. They are also known for their Coconut crab (Birgus latro), the world's largest land crab, and hammerhead sharks, manta rays, barracuda and as a breeding ground for green turtles and hawksbill turtles; in older times, its dominant land predator was the crocodillian Aldabrachampsus. Birds of Aldabra include the Aldabra rail, the last surviving flightless bird of the Indian Ocean region, and the endangered Malagasy Sacred Ibis as well as large numbers of nesting seabirds. Two species of bats, Paratriaenops pauliani and Pteropus aldabrensis, are known only from Aldabra.